Philotheca buxifolia (syn. 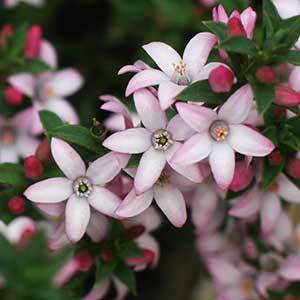 Eriostemon buxifolius) is a small upright shrub, commonly called the Box-Leaf Waxflower. Grown for the small star shaped flowers that appear in spring to summer, this is a low growing plant that can be used as a ground cover. In a well drained humus rich soil and a sunny position this is a low care plant. A little mulch around the base of the plant will keep the root system cool as well as suppress weeds. The root system itself does not like to be disturbed once established, so avoid transplanting and avoid digging around the base of the plant. Common Names – Box-leaf Waxflower.